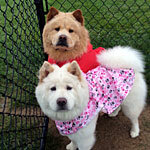 Iam sure Santa will leave something good for those two well behaved chows!! Hope you all have a wonderful holiday! That's a great picture! I wish my two would 'pose' for me. Merry Christmas! These benefits are good for me.